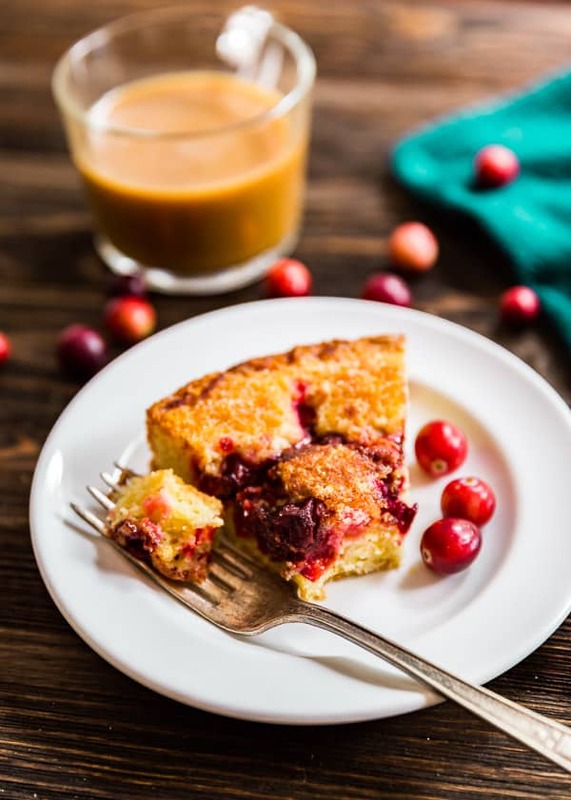 Need a good substitute for pie this holiday season? 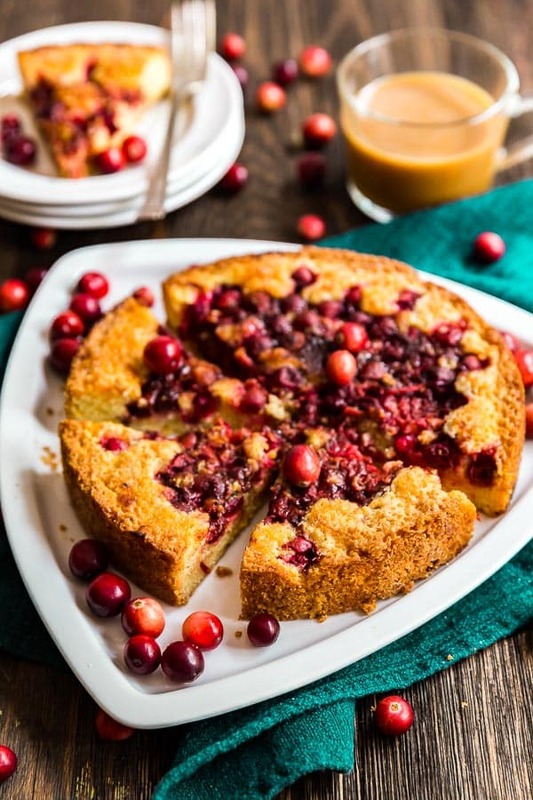 This Orange Cranberry Torte will bring all the delicious flavors of the season without having to battle with a pie crust! If you follow me on Instagram stories, then you were likely inundated with my adventures learning about beef and veal production with the New York Beef Council. It was an absolutely incredible experience getting to tour the farms and speak extensively with the farmers. As a bonafide suburbanite, I’ll be the first one to admit that it can be so easy to lose track of where our food comes from. This weekend definitely opened my eyes and made me want to learn more and share what I learned (which was so much that I could fill a whole other post!). The only downside of the weekend is that I didn’t get to spend much time with my girls. That being said we had a very joyful reunion when I returned home on Sunday in the late afternoon and a great evening. So this morning, J was taking T to her post-tubes follow up. It was super rainy and gray outside and I told him that I would take A into daycare so that he had one less thing to worry about this morning. A was super excited to get to wear her raincoat and rainboots (Hello Kitty- passed down from her older cousin in California) and all was going well. So we got into her daycare room and I helped her remove her coat. And as I started to leave, it began…basically the world ended, at least for A. She got super upset that I was leaving, which really isn’t like her. First of all, she’s a big Daddy’s Girl. Second, she loves daycare and is generally always excited to get to be around all her friends. But today was different. I’m thinking it was a combination of the fact that it was so gray and gloomy out and also the change in routine (usually Daddy does drop-offs). And most of all, I think it had a lot to do with me not being around much over the weekend. It was heart-wrenching to have to leave. I never like having to leave my babies anyway (what mother does?) but today was even more difficult. I’m sure I didn’t help matters by sticking around and drawing it out. I eventually did leave and I’m pretty positive she was probably totally fine a minute or two later. But ugh, my heart broke. Back when I was pregnant, I was browsing Smitten Kitchen. 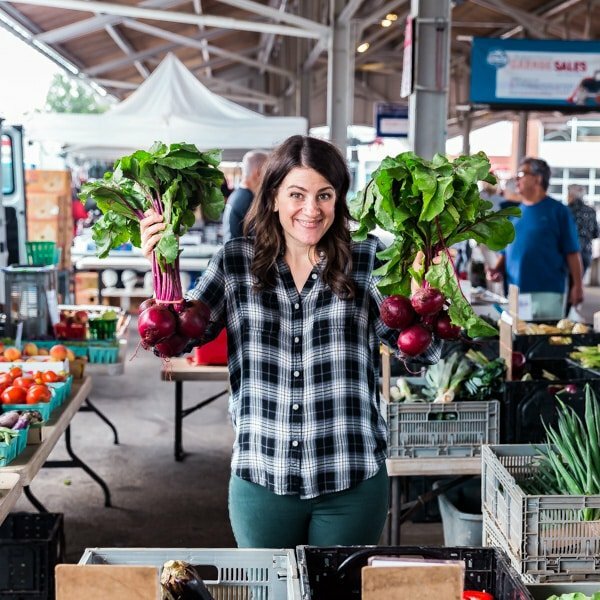 At risk of sounding like a hopeless fangirl, I have such a foodie-crush on Deb. Smitten Kitchen was the first blog I ever read (or at least remember reading). 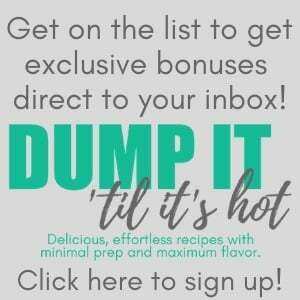 I’ve made countless recipes from there over the years and they’ve all been so delicious! Being that I’m a lover of plums, when I found the Plum Torte that Deb blogged, based on a famous New York Times recipe, I pinned it to make and could not stop thinking about it until I finally found the most gorgeous plums at the public market. I got to work and could not believe how simple and quick this dessert was to make. The best part is, it tastes even better when made the night before. My kind of recipe! So I got to thinking, wouldn’t this be a great option for Thanksgiving? The problem is, plums aren’t exactly readily available in these parts during November. 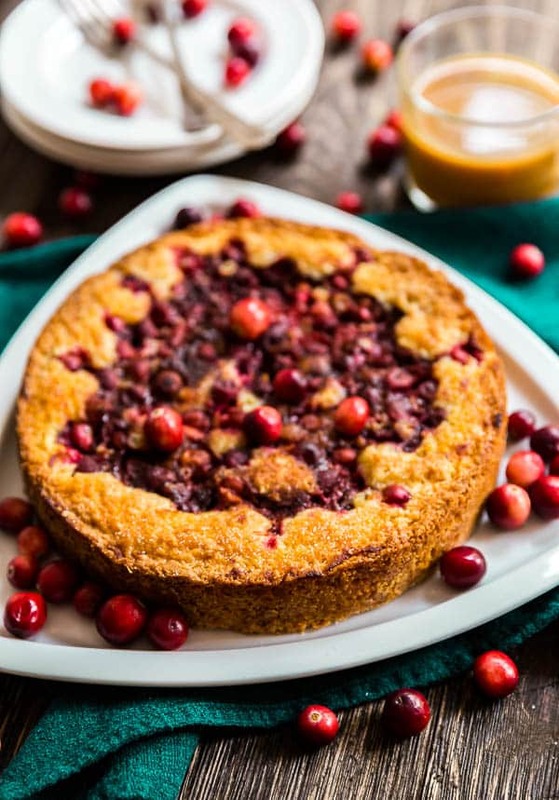 And when I thought about some of my favorite holiday flavors, the combination of orange and cranberries kept popping into my head. So I made it once again with a few small changes and I could not have been more thrilled. Since then I’ve made this countless times and each and every time it comes out exactly the same: perfect. Now the original recipe says to use a Springform pan , but mine was too big so I opted for an 8 inch cake pan I made sure to line the bottom with parchment paper and sprayed the whole thing down with cooking spray. Then I used a butter knife to carefully cut around the perimeter before removing it from the pan. The tartness of the cranberry adds the most lovely zing and stands up well next to the sweetness of the torte and the subtle orange hints. 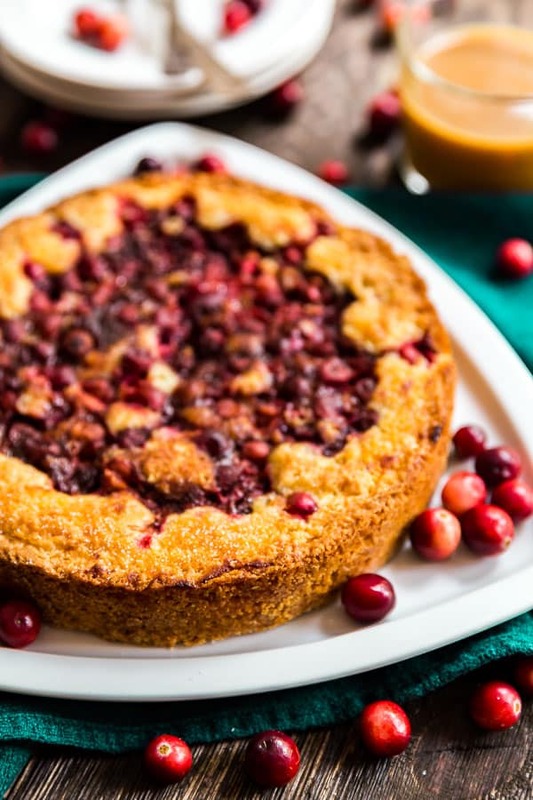 While the plums still have my heart, I am thrilled with how this variation turned out and this Orange Cranberry Torte will have a happy home on our Thanksgiving dessert table for many years to come. 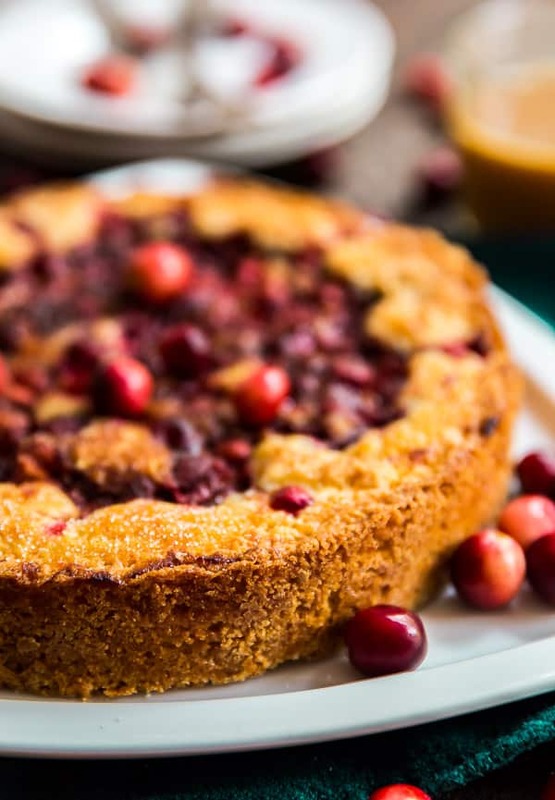 This Orange Cranberry Torte is so simple and easy to make and is the most delicious combination for sweet and tart. It's even better when made the night before and is and especially great cake for the holidays! Spray down the pan with cooking spray and then line the bottom with parchment paper. Cream the butter and the cup of sugar together until fluffy. Add the next four ingredients and mix until just combined. Do not over mix. The batter will be sticky and that's ok. Spread the batter along the bottom of your prepared pan and smooth until even. Sprinkle this mixture over the top of the cake. Give it a quick spray of the cooking spray on top. Bake for 45 minutes or until your cake tester comes out clean. This can be served once it's cooled, but it's better the next day (one cooled, cover and leave out at room temperature). This lasts a couple days on the counter and then move it to the refrigerator. 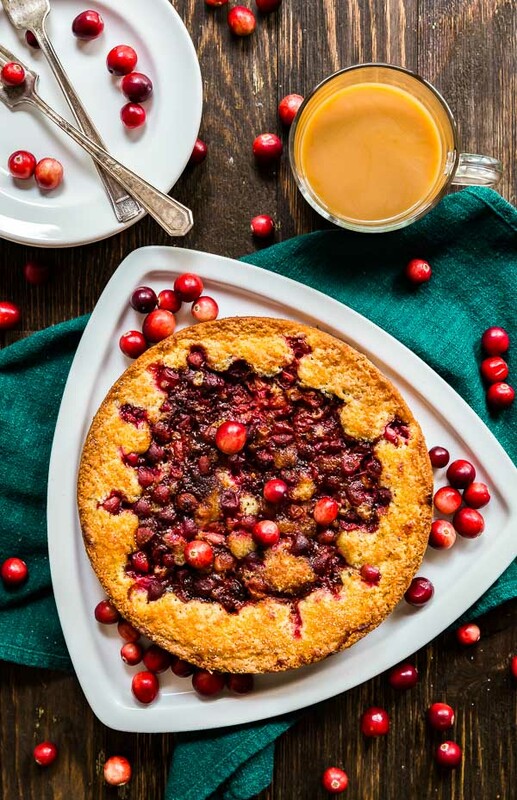 November 23, 2015 at 1:40 pm It'll definitely be on our dessert table! November 25, 2015 at 11:02 am Thank you! I hope you enjoy it and have a great holiday! December 1, 2015 at 3:51 pm Thank you- it's one of my favorite flavor combos! December 1, 2015 at 3:58 pm I so want this. I love cranberries. Thanks for posting. Hello from Motivation Monday. 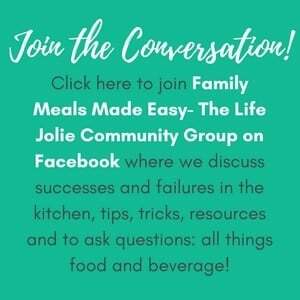 Melissa French, The More With Less Mom recently posted...Want to Know What the Homeless REALLY Want in Care Packages? The Real Deal From a Mama Who Has Been There. December 1, 2015 at 4:20 pm Thanks Melissa- I love them as well! October 18, 2017 at 11:55 am Thank you! You don't need an excuse- you should make it because it's delicious and you deserve it :) Norway is seriously high on our list of amazing places to check out! November 20, 2017 at 3:26 pm These flavors look amazing! What a beautiful torte! November 21, 2017 at 7:19 pm Love the combo and the video! November 21, 2017 at 11:33 pm Thanks Megan! November 24, 2017 at 10:48 am Looks colorful and delicious too! November 24, 2017 at 9:51 pm Thank you Richa! November 24, 2017 at 6:15 pm This looks incredible!